The Dance and the Dawn is a popular theatre-style larp. It has been widely played, with Larp Resume listing 21 runs across the USA, New Zealand, Ireland and China. It was written by Warren Tusk and is published by Paracelsus Games. It was based on a tabletop roleplaying game by Dev Purkayastha. The larp first ran in 2006, and a public release was funded via Kickstarter in 2011. There is a sequel / alternate character pack, Dreams of Ice and Ash. Once upon a time, there was a beautiful lady... ...and things didn't go so well for her. She had to make sacrifices; that's just how the world works, you know? Eventually, she had to sacrifice her heart. Now she has one chance to get it back, to find her true love. The Dance and the Dawn tells the tale of six beautiful Ladies who came to the court of the Queen of Ice for a midnight ball, and there danced with seven noble Lords, all in pursuit of the True Love that could heal their hearts. The conclusion of that tale is up to you. Fifteen participants are required, as well as an out-of-character Orchestrator to manage and oversee the experience. 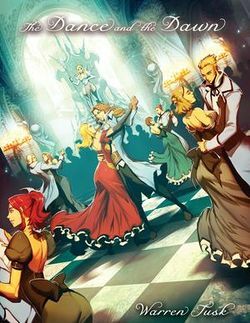 Six players become the Ladies of Ash, who have come to the midnight ball in hopes of healing their heartbreak; seven become the cold, proud Lords of Ice who are there waiting for them, and who struggle with tragedies of their own; the other two become the Queen of Ice and the Duke of Ash, the enigmatic figures who have arranged the whole affair. The game lasts four to five hours, which will be taken up with dancing and dueling and courtly intrigue...and, of course, with the eternal hope of romance and joy. ↑ The Dance and the Dawn, Larp Resume. Retrieved 7 January 2015. Note that Larp Resume listings are usually incomplete. ↑ Alumni Report: The Dance and the Dawn, Game Chef, 2012. Retreived 7 January 2015. ↑ The Dance and the Dawn: A Theatrical Experience, Kickstarter. Retreived 7 January 2015. This page was last modified on 12 May 2017, at 21:35.